Human Coronary Artery Smooth Muscle Cells (HCASMC) provide an excellent model system to study all aspects of cardiovascular function and disease, especially those related to mechanisms of hyperplasia and hypertrophy of intimal smooth muscle cells leading to vascular occlusion in atherosclerosis and stent restenosis. (Click to Enlarge) Human Coronary Artery Smooth Muscle Cells: HCASMC are isolated from two major vessels that supply the heart with blood. 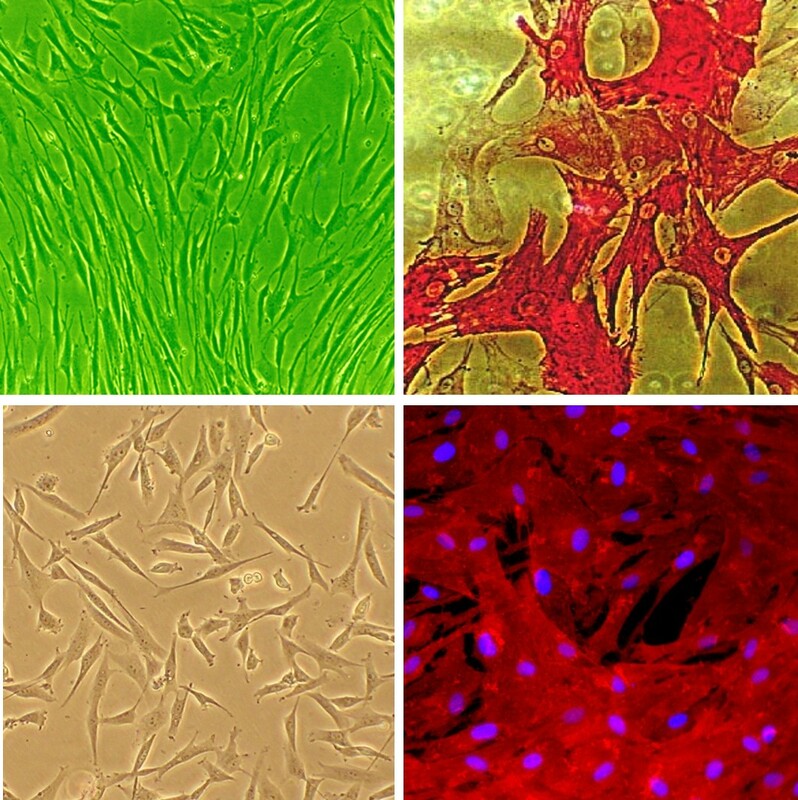 TOP: Phase-contrast microscopic image under green light (L), Differentiated HCASMC stain positive for smooth muscle cell-specific alpha-actin expression (R). BOTTOM: Phase contrast (L) and composite fluorescent image of cells (red), and nuclei (blue) counterstained with DNA-specific DAPI probe. Shah, F., Stepan, A.F., O'Mahony, A., Velichko, S., Folias, A.E., Houle, C., Shaffer, C.L., Marcek, J., Whritenour, J., Stanton, R. and Berg, E.L., 2017. Mechanisms of Skin Toxicity Associated with Metabotropic Glutamate Receptor 5 Negative Allosteric Modulators.Cell Chemical Biology, 858-869.e5. Baskar, K., S. Sur, V. Selvaraj and D. Agrawal. 2015. Functional constituents of a local serotonergic system, intrinsic to the human coronary artery smooth muscle cells. Molec Biol Repts, 42:1295-1307. Boosani, C., K. Dhar, and D. Agrawal. 2015. Down-regulation of hsa-miR-1264 contributes to DNMT1-mediated silencing of SOCS3. Molec Biol Repts, DOI 10.1007/s11033-015-3882-x. Gupta, M., S. Lee, S. Crowder, X. Wang, L. Hofmeister, C. Nelson, L. Bellan, C. Duvall, and H. Sung. 2015. Oligoproline-Derived Nanocarrier for Dual Stimuli-Responsive Gene Delivery. Journal of Materials Chemistry B, DOI: 10.1039/C5TB00988J. Han, Y., Y. Cho, R. Ayon, R. Guo, K. Youssef, M. Pan, A. Dai, J. Yuan and A. Makino. 2015. SGLT inhibitors attenuate NO-dependent vascular relaxation in the pulmonary artery but not in the coronary artery. Am J Physiol Lung Cell Mol Physiol, 309:L1027-L1036. Simone, T., S. Higgins, J. Archambeault, C. Higgins, R. Ginnan, H. Singer, and P. Higgins. 2015. A small molecule PAI-1 functional inhibitor attenuates neointimal hyperplasia and vascular smooth muscle cell survival by promoting PAI-1 cleavage. Cellular Signalling, 27:923-933. Yu, Y., s. Wise, P. Michael, D. Bax, G. Yuen, M. Hiob, G. Yeo, E. Filipe, L. Dunn, K. Chan, H. Hajian, D. Celermajer, A. Weiss and M. Ng. 2015. Characterization of Endothelial Progenitor Cell Interactions with Human Tropoelastin. PLoS ONE 10(6): e0131101. Kiyan, Y., S. Tkachuk, D. Hilfiker-Kleiner, H. Haller, B. Fuhrman, and I. Dumler. 2014. oxLDL induces inflammatory responses in vascular smooth muscle cells via urokinase receptor association with CD36 and TLR4. J. Mol. & Cell. Cardiol. 66:72-82. Lange, M., T. Fujikawa, A. Koulova, S. Kang, M. Griffin, A. Lassaletta, A. Erat., E. Tobiash, C. Bianchi, N. Elmadhun, F. Selke, and A. Usheva. 2014. Arterial territory-specific phosphorylated retinoblastoma protein species and CDK2 promote differences in the vascular smooth muscle cell response to mitogens. Cell Cylcle, 13:315-323. Dhar, K., K. Rakesh, D. Pankajakshan, and D.K. Agrawal. 2013. SOCS3 promotor hypermethylation and STAT3-NF-κB interaction downregulate SOCS3 expression in human coronary artery smooth muscle cells. Am. J. Physiology. 304:H776-H785. Fujita, H., K. Miyadera, M. Kato, Y. Fujioka, H. Ochiiwa, J. Huang, K. Ito, Y. Aoyagi, T. Takenaka, T. Suzuki, S. Ito, A. Hashimoto, T. Suefuji, K. Egami, H. Kazuno, Y. Suda, K. Nishio, and K. Yonekura. 2013. The Novel VEGF Receptor/MET–Targeted Kinase Inhibitor TAS-115 Has Marked In Vivo Antitumor Properties and a Favorable Tolerability Profile. Molecular Cancer Therapeutics. 12:2685-2696. Lange, M. 2013. Artery Specific Differences in Cell Cycle Regulation are Associated with Serum Induced Proliferation of Vascular Smooth Muscle Cells. University of Applied Science Bonn-Rhine-Sieg, MSc dissertation. Mociornita, A. 2013. The Role of Human Leukocyte Antigen-G in Cardiac Allograft Vasculopathy. University of Toronto, MSc dissertation. Wu-Wong, J.R., M. Nakane, Y.-W. Chen, and W. Qiang. 2013. Different Effects of Calcidiol and Calcitriol on Regulating Vitamin D Receptor Target Gene Expression in Human Vascular Smooth Muscle Cells. J. CARDIOVASCULAR DISEASE. 1:15-20. Albasanz-Puig, A., J. Murray, M. Namekata, and E.S. Wijelath. 2012. Opposing roles of STAT-1 and STAT-3 in regulating vascular endothelial growth factor expression in vascular smooth muscle cells. Biochem. & Biophys. Res. Comm. 428:179-184. Crowder, S.W., M.K. Gupta, L.H. Hofmeister, A.L. Zachman, and H.-J. Sung. 2012. Modular polymer design to regulate phenotype and oxidative response of human coronary artery cells for potential stent coating applications. Acta Biomaterialia. 8:559-569. Feng, G.-M., J.-H. Chen, C.-I. Lin, and J.-M. Yang. 2012. Effect of docosahexaenoic acid on hypoxia/reoxygenation injury in human coronary arterial smooth muscle cells. Eur J Nutr. 51:987-995. Khachigian, L. 2012. Vascular therapeutics. Patent US 8242090 B2. Nivison‐Smith, L., and A.S. Weiss. 2012. Alignment of human vascular smooth muscle cells on parallel electrospun synthetic elastin fibers. Journal of Biomedical Materials Research Part A. 100:155-161. Nivison-Smith, L., J. Rnjak, and A.S. Weiss. 2010. Synthetic human elastin microfibers: Stable cross-linked tropoelastin and cell interactive constructs for tissue engineering applications. Acta Biomaterialia. 6:354-359. Zhou, J., G. Hu, and X. Wang. 2010. Repression of Smooth Muscle Differentiation by a Novel High Mobility Group Box-containing Protein, HMG2L1. Journal of Biological Chemistry. 285:23177-23185. Zhang, M.-X., C. Zhang, Y.H. Shen, J. Wang, X.N. Li, Y. Zhang, J. Coselli, and X.L. Wang. 2008. Biogenesis of Short Intronic Repeat 27-Nucleotide Small RNA from Endothelial Nitric-oxide Synthase Gene. Journal of Biological Chemistry. 283:14685-14693. Zhou, J., E. Blue, G. Hu, and P. Herring. 2008. Thymine DNA Glycosylase Represses Myocardin-induced Smooth Muscle Cell Differentiation by Competing with Serum Response Factor for Myocardin Binding. J Biol Chem, 283:35383-35392. Wu, K., C. Huang, J. Wei, L. Tsai, C. Hsu, Y. Chen, J. Yang, and C. Lin. 2007. Vasodilator action of docosahexaenoic acid (DHA) in human coronary arteries in vitro. The Chinese journal of physiology. 50:164-170. Jin, Y., E. Blue, and P. Gallagher. 2006. Control of Death-associated Protein Kinase (DAPK) Activity by Phosphorylation and Proteasomal Degradation. J Biol Chem, 281:39033-39040. Wu, S.-N., P.-H. Lin, K.-S. Hsieh, Y.-C. Liu, and H.-T. Chiang. 2003. Behavior of Nonselective Cation Channels and Large-Conductance Ca2+-Activated K+ Channels Induced by Dynamic Changes in Membrane Stretch in Cultured Smooth Muscle Cells of Human Coronary Artery. Journal of Cardiovascular Electrophysiology. 14:44-51. Wu, S.-N., H.-T. Chiang, F.-R. Chang, C.-C. Liaw, and Y.-C. Wu. 2003. Stimulatory Effects of Squamocin, an Annonaceous Acetogenin, on Ca2+-Activated K+ Current in Cultured Smooth Muscle Cells of Human Coronary Artery. Chemical Research in Toxicology. 16:15-22. Khachigian, L.M., R.G. Fahmy, G. Zhang, Y.V. Bobryshev, and A. Kaniaros. 2002. c-Jun Regulates Vascular Smooth Muscle Cell Growth and Neointima Formation after Arterial Injury. Journal of Biological Chemistry. 277:22985-22991. Khachigian, L.M., R.G. Fahmy, G. Zhang, Y.V. Bobryshev, and A. Kaniaros. 2002. c-Jun Regulates Vascular Smooth Muscle Cell Growth and Neointima Formation after Arterial Injury: INHIBITION BY A NOVEL DNA ENZYME TARGETING c-Jun. Journal of Biological Chemistry. 277:22985-22991.